This one got lost in the shuffle during the summer months. While at the intersection of Cecil B. Moore and Ridge Ave in North Philly for who knows what reason, I spotted Mr. Bubbles Seafood truck (MR. B) and decided to give them a try. 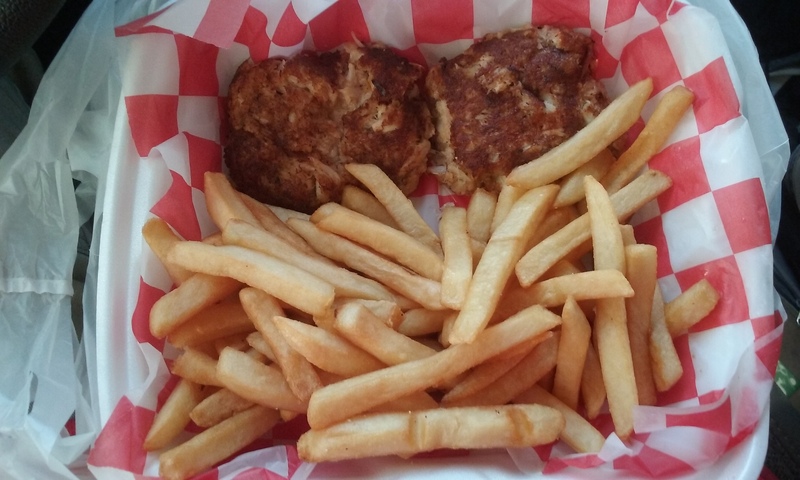 I am happy I did as the strawberry ice tea was AWESOME and given to me complimentary for the extremely long wait for my original order of crab cakes with fries. Let us talk more about this strawberry ice tea. I would drive back to Mr. B to drink gallons of this stuff, it was that good. They should find someone to be able to bottle this up and make a gazillion dollars. I am happy I was given the tea. Fries were basic as was the crab cake. What I can tell you though, is the gentleman behind the counter was so enthusiastic, friendly, and happy even though it was one of those 100 degree sweltering summer days and he was just in the truck sweating and singing while he took orders and sang with a not so friendly line of patrons giving him a hard way to go at times. For a food truck the menu was quite varied and I would be interested to try other things from them. I would give Mr. B another try and order something else, but also just so I can have another cup of that tea. Posted in Restaurants and tagged intersection of cecil b moore and ridge ave, Mr. Bubbles Seafood, philadelphia, seafood food truck in philly. Bookmark the permalink.